"You want me to do what on that fake grass? I know you know what the dog does there." If you've invested in an indoor patch of grass for your dog to potty on, it may have occurred to you how convenient it would be if your cat would use it, too. It would be nice to ditch the litter box, but for most people, that's just wishful thinking. Dogs and cats have different instincts when it comes to relieving themselves. Dogs make deposits on the go, leaving their mark and trotting off. Cats, on the other hand, instinctively bury their business, digging a hole before doing the deed, and then covering it up once they're finished. If you've ever watched a cat select a spot outdoors to relieve himself, you're likely to have seen him choose a spot in loose dirt he can dig in, and not a spot on the lawn. This natural tendency makes it unlikely that your cat will make the transition to using your dog's potty patch and free you up from servicing more than one pet latrine a day. If your cat has a problem that causes him not to use the litter box, don't count on him using and indoor patch of grass as his alternative. Usually cats who won't use the litter box will look for a soft, absorbent place to eliminate, a place where he won't end up standing in a puddle. That's why a kitty who is having a behavioral issue or health concern that is causing him to shun his litter box typically goes on the carpet, a pillow or even your bed. Grass and dirt can be absorbent but not as much as the soft surface of your sofa. Setting up a private piddle place will ensure that you'll only have two pet places to clean each day -- one for the dog and one for the cat -- and that they'll be appropriate places. Get a litter box that is big enough for your cat to comfortably turn around in and sit in without spilling over the side. The sides of the box should be at least 3 inches high but no more than 6 inches to help him get in and out and to keep litter inside. If kitty appears to be irritated in any way by the litter, change to a different brand. 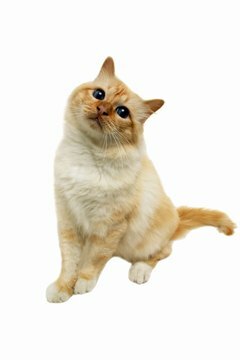 Some litters are coarse and might not feel good on your cat's paws, or he may not like scented litter. Placing two boxes side by side with different types of litter will help you determine what kind he prefers. Put the litter box in a quiet location to allow him some privacy; consider keeping two at all times; once you know his preferred litter type you can place them in separate areas. Always have at least as many litter boxes as you have cats. Change or scoop the litter daily to keep it clean and inviting. Cat's aren't generally thought of as highly trainable animals, but you can encourage them when they have a natural tendency -- and there's always a chance that your cat is a very special feline who delights in pleasing you. However unlikely it might be, you could encourage your kitty to use your dog's potty patch and see what happens. Put his litter box and the patch of indoor grass next to each other to let him know what your intention is. He'll see your dog doing his duty on the patch of grass and might want to give it a try himself. If you catch him in the act, wait until he's finished up and then praise him like he just broke the code for cold fusion. How Long Should It Take to Housebreak a Miniature Dog? Is Real Tuna or Salmon Bad for Cats? Why Does My Puppy Hate to Be Held?